Be the first to share your favorite memory, photo or story of Verna Ruthene. This memorial page is dedicated for family, friends and future generations to celebrate the life of their loved one. Mrs. Verna Ruthene Wallace Pierce of Murfreesboro, Tennessee, daughter of the late Vernard Aried Wallace and Iona Beatrice Chaudoin Wallace, was born on Friday, February 21, 1936 in Green County, Kentucky and departed this life on Sunday, October 7, 2018 at the Vanderbilt University Medical Center in Nashville, Tennessee. She was 82 years, 7 months, and 16 days of age. 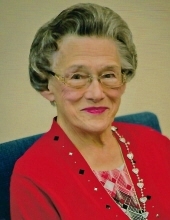 She had made a profession of faith in Christ and was a member of the Corner Stone Free Will Baptist Church in Tennessee. She was also a retired seamstress for Handmacher Manufacturing Company. She united in marriage to Ray Junior Pierce on September 2, 1954 who preceded her in death on February 19, 2010. Survivors include two sons and daughters-in-law: Anthony Earl and Mildred Pierce of Elizabethtown, Stephen Ray and Deanna Pierce of Glasgow; two daughters and sons-in-law: Carol Gale and Glenn Hall of Alabama, and Fredia Marie and Anthony Poff of Tennessee; a special daughter-in-law: Lynne Pierce of Glasgow; six grandchildren: Timothy David Pierce, Jacob Blaine Pierce, Kristi Lynne Pierce, Jeffrey Daniel Pierce, Amber Hall Gaddy, and Jordan Michael Pierce; four great-grandchildren: Jaxon Pierce, Mark Pierce, Tanner Pierce, and John Solomon Gaddy; a brother and sister-in-law: James Allen and Bonnie Wallace of Greensburg; a brother-in-law & sister-in-law: Ralph & Lottie Pierce of Greensburg, and a host of other relatives and friends. She was preceded in death by 3 sisters-in-law and 1 brother-in-law: Juver Davis, Geneva McAllister, Elsie Shirrell, and Les Pierce. The funeral services for Mrs. Verna Ruthene Wallace Pierce will be conducted at 1:00 P.M., Central Time, Friday, October 12, 2018 at the Cowherd and Parrott Funeral Home in Greensburg with burial to follow in the Pierce Community Cemetery. Bro. Aaron Harris, Bro. Billy Walker, and Bro. Stanley Outlaw officiating. Visitation is requested from 4 P.M. until 8 P.M., Thursday, at the Cowherd and Parrott Funeral Home and after 7 A.M., Friday until time of the funeral service. The family has asked that expressions of sympathy take the form of donations to the Pierce Community Cemetery or the Corner Stone Free Will Baptist Church, which can be made at the funeral home. To plant a tree in memory of Verna Ruthene Wallace Pierce, please visit our Tribute Store. "Email Address" would like to share the life celebration of Verna Ruthene Wallace Pierce. Click on the "link" to go to share a favorite memory or leave a condolence message for the family.